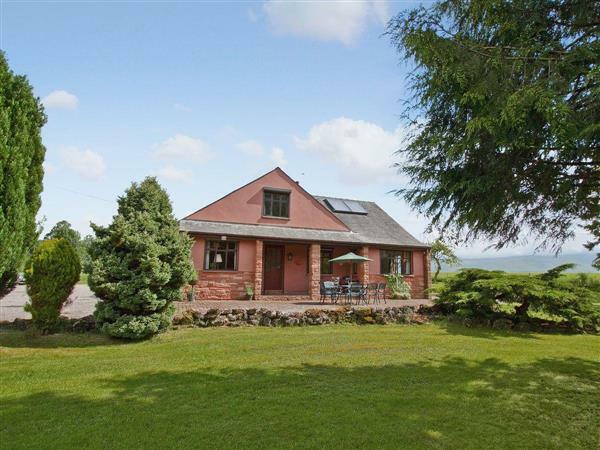 Beck Mill Cottage in Langwathby, Penrith, Cumbria sleeps 10 people. Attractively positioned above a mill pond, this outstanding detached property is set within two acres of grounds and has uninterrupted views to the Pennines. The flat plateau of Cross Fell dominates the horizon and creates an amazing backdrop which is ever changing – in particular the stunning sunsets can be enjoyed from both inside and outside from the patio areas. Although a traditional style of cottage, the interior has been totally modernised to a high standard with an excellent level of presentation and attention to detail. This lovely holiday cottage is ideal for families and friends exploring one of the loveliest corners of England. The peaceful location with its ponds and woodland attracts a variety of wildlife, and is a haven for nature lovers. Beck Mill Cottage is located within the beautiful Eden Valley, which is renowned not only for its scenery, wonderful walking, pretty sandstone villages and quiet country lanes which are ideal for cycling, but it is also perfectly placed between the Lake District and Yorkshire Dales National Parks. The cottage is 8 miles from the market town of Penrith. Some notable attractions in the area include Brougham Castle and the stunning Dalemain. The latter mentioned is a country house set within large grounds – its medieval courtyard and Elizabethan great barn featured in the TV adaptation of Charlotte Bronte’s Jane Eyre. Not to be missed is a trip to Cumbria’s Rheged Discovery Centre which – apart from its huge IMAX cinema showing giant movies – is home to the National Mountaineering Exhibition and the Discovering Cumbria Exhibition. There is an organic restaurant at The Village Bakery in Melmerby, and a Watermill at Little Salkeld that uses mainly organic produce in their tearoom and mill shop - they also have one day baking courses for adults and children. The Carlisle to Settle railway has a station at Langwathby for a day out without a car. Spacious living room with wood burning stove and views to the Pennines. Large beamed well-equipped kitchen/dining room. Two bedrooms; one double with en-suite shower room/W.C. and one twin-bedded with garden views. Bathroom/W.C. with over-bath shower. First Floor: Double bedroom with en-suite shower room/W.C. Two further double rooms. Shower room/W.C. For a better idea of where Beck Mill Cottage is, you can see Beck Mill Cottage on the map below. Beck Mill Cottage is in Cumbria; should you be on the lookout for a special offer, you can find all the special offers in Cumbria. It's always worth checking to see what is on offer at the moment. Do you want to holiday near Beck Mill Cottage (LK5), you can see other cottages within 25 miles of Beck Mill Cottage; have a look to find your perfect holiday location.